Our Six-Parameter Pen-Style water quality tester can simultaneously measure pH, Conductivity, ORP, Temperature (°C/°F), TDS (Total Dissolved Solids) and Salinity...all in one meter! It does not require a power supply to operate, so it can be used anytime and anywhere (replaceable batteries). Measured value is accurately shown in the large, easy to read and clear LCD. 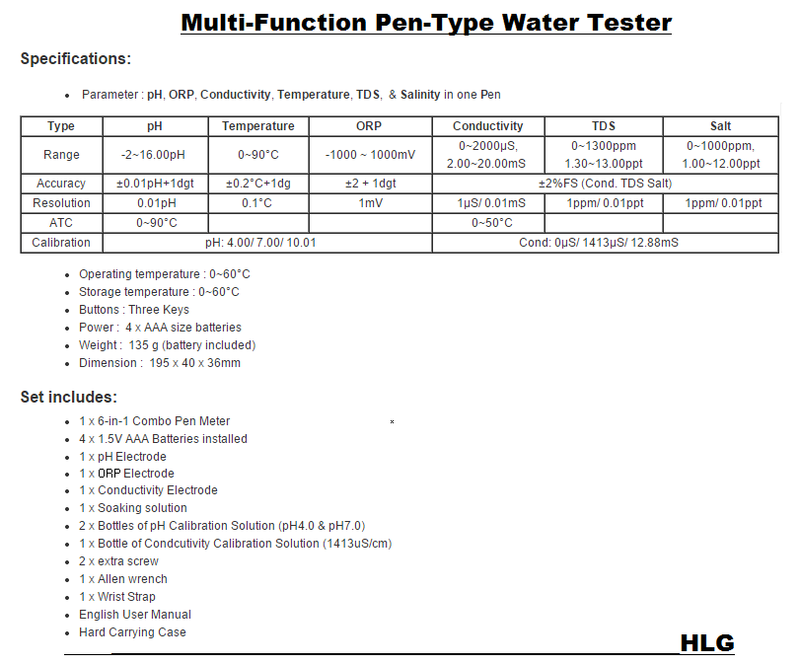 It has wide range applications ability as an ideal tool for all water quality testing...ranging from Agriculture, Aquariums, Boilers, Chemical Industry, Drinking Water, Fish Farming, Food industry, Gardening, Hydroponic, Laboratory usage, Plating industry, Swimming pool & Spa, Water Treatment, etc. FREE 5-7 Business Day Express Shipping! WORLDWIDE Shipping!